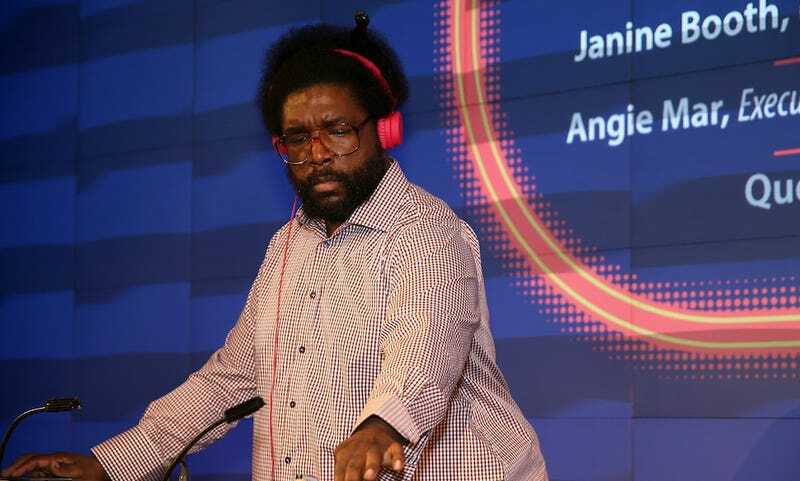 Pandora is trying valiantly to stay afloat in a sea filled with competitors like Spotify and Apple Music, and now the company has tapped music legend Questlove to help rescue it from the murky depths of irrelevance. Following the news the platform is trying to add an on-demand streaming component, the New York Times reports that it’s also partnered with the producer and Roots drummer to launch a weekly radio show on September 7th. Pandora seems quite excited about the partnership, in much the same way a gasping, dehydrated marathon runner might look at a bottle of water. “We are entering into a new phase for the company,” Pandora co-founder Tim Westergren told the Times. “We are working more directly with labels and artists. We really want to invest a lot in that nexus, and having someone like him bridge that and speak on our behalf is really powerful.” The show seems to be a play for what Apple Music does—artist-run radio shows—but the latter service has the distinct advantage of a ton of artists providing content, not just one. Pandora initially launched in 2000, and reinvented itself as an online radio service in 2005. Despite arriving very early on the scene, it has been hit hard by the arrival of flashier competitors. It has a lot of users, but it’s failed to turn all of those users into a viable business. Its stock price is in the gutter, and rumors popped up in February that it was thinking about selling itself. Amongst the company’s biggest issues has been the failure to evolve—it’s still focused on radio. Who really wants to rely on a random radio playlist when you can listen to whatever you want with a service like Spotify? Pandora’s recent interest in an on-demand streaming service suggests it wants to change this, but it’s getting pretty late in the game for that at this point. Indeed, the company seems frantic in its attempts to right the ship, having recently snapped up Ticketmaster competitor Ticketfly, bankrupt streaming site Rdio, and music data company Next Big Sound. Will any of this work? Who knows! The music streaming landscape is tough, and it might be too late, no matter how cool Questlove is.